Over the years, fans of the longggggg- (and I mean lonnnnnnnggggg) running animated show The Simpsons have seen plenty of books written about it. Some tackle the philosophy, some the satire, and some the humor found in the show. Mike Reiss, a long-time writer for the series, writes an entertaining autobiography/fan guide combo for a show that’s marking its 30th season on air starting in the Fall of 2018. 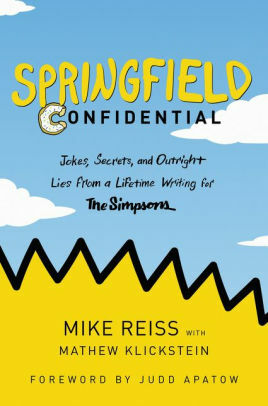 Reiss’s book splits evenly between a discussion of his life/early career and his time on The Simpsons. He wrote for other “hits” in the past, such as The Critic, Sledge Hammer!, and It’s Garry Shandling’s Show. If anything, he demonstrates that you can make a neat career through perseverance and hitting a couple of home runs along the way. His puns, one-liners, and satire are also found throughout the book. Yes, you will chuckle and perhaps laugh quite a bit. Beyond his life, Reiss brings a fair bit of insight into how an episode of The Simpsons is put together from start to finish, from Los Angeles to South Korea and back. He also talks about the show itself, albeit not to a huge extent, devoting some space to his colleagues and the voices that make up the beloved series. As one who has watched most of The Simpsons episodes, the process behind how each one is put together is interesting and I appreciate reading that. Beyond that, the book reads quickly and provides several funny moments (I learned the children’s book business is kinda sleazy!). I also picked up some Kardashian jokes along the way. It’s not going to make for the most intelligent, thought-provoking read, but you will laugh and learn a little more about the longest-running primetime television series in history.